Arthur Hopwood coined the term Proconsul after the famous chimpanzee “Consul the Great.” Proconsul was a medium sized ape represented by four species: P. africanus; P. heseloni; P. major; and P. nyanzae. The best known of the “dental apes,” Proconsuls teeth displayed the Y-5 pattern characteristic of modern apes (Stanford). According to Hartwig, “Proconsul was an arboreal, quadrupedal catarrhine most similar in locomotive ability to a modern colobus monkey. 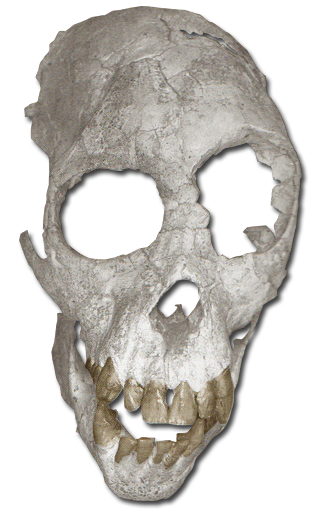 This genus exhibited a short broad face with sweeping zygomatic arches, a broad nasal aperture, and a broad intraorbital region.” With an estimated cranial capacity of 167.3 c.c., Proconsuls brain size is larger than that of most modern monkeys (Murdock). Anthropologists have argued as to whether or not Proconsul retained a tail. According to Nakatsukasa, et al., “Recovered sacral vertebra indicates that Proconsul did not have a tail. The anatomical affinities of the last sacral and postsacral vertebra of monkeys and apes are clearly distinguishable. The resemblance of that vertebra in Proconsul to that of modern apes is remarkable.” The lack of a tail would suggest that they were lost early in hominoid evolution (Murdock). 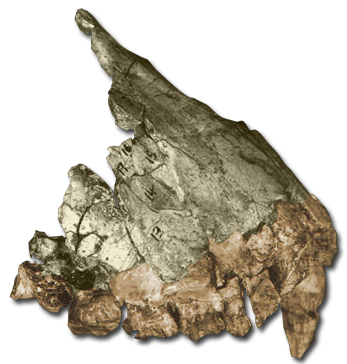 Proconsul is the earliest known hominoid discovered to date. This catarrhine displayed dental was intermediate in dental size between H. syndactylus and P. troglodytes. P. africanus is distinguished by its bilaterally compressed lower canines and the greater height differential of buccal to lingual cusps of the upper premolars (Hartwig). P. major was the largest of the genus with postcrania remains indicating a body size of 166 pounds, comparable to a modern male orangutan (Hartwig). The species can be recognized dentally by its broad upper and lower incisors and lack of bilateral compression of the upper and lower canines. Postcranial remains consist of humeral, tibial, and femoral fragments along with a talus and partial calcaneous. Other than size, P. major has a very corresponding anatomy with the rest of the genus (Hartwig). P. heseloni has very well documented postcrania and weighed in slightly larger than a modern siamang with females approximately 22 pounds and males 44. The anatomy suggests a morphotype of primitive catarrhine and extant hominoid features. According to Hartwig, “The thorax, lumbar, and sacral regions, along with the illium are all long and narrow which is representative of monkeys. The limb bones were robust as was the hallux which provided for a powerful gripping ability.